Through the Looking Glass with DELL. 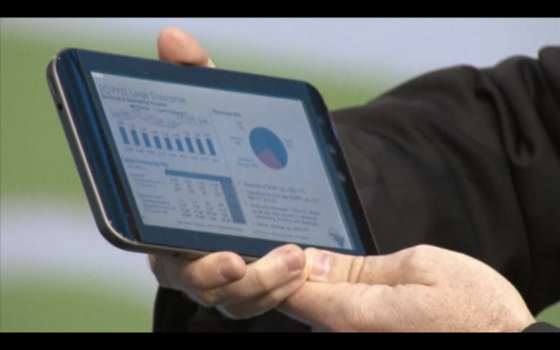 Dell’s latest tablet the “Looking Glass” has finally made its silver screen (more or less) appearance when it was demonstrated on stage by the CEO himself at Oracles OpenWorld Conference in San Fransisco this year, in the video forward to 1:40 for the CEO to presenting the tablet, the video shows very little details but whats discernible is a 3.5mm jack, a volume rocker on the side of the device and a PDMI port and a switch which possibly could be rotation lock or turning on silent mode. 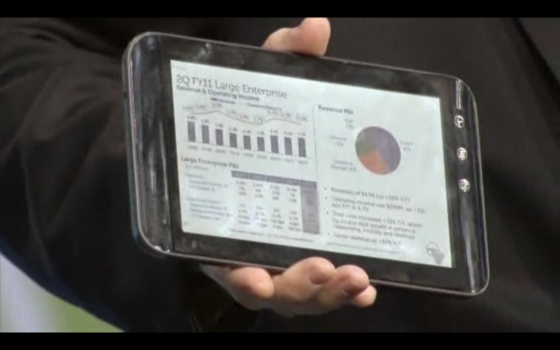 The Android powered tablet has been in a long wait by Android fans everywhere as you can see the tablet looks amazing and there are even some pictures of it. This tablet albeit smaller than the iPad or even the Slate might be a better performer than the Slate atleast considering its running on an Android OS. Although the video shows it to be a little slow at the beginning I am sure it can be fixed in the final model.